As you know, I am trying to modify what I’m eating during the weeks because I let too much sugar and bread and carbs creep in on the daily. At the same time, I am going easy on myself and like to indulge. Striking a balance is hard, so over the years I’ve tried adopting a weekends-off approach from time to time. So far, it’s going well this time around. I’ve learned I’m not alone in my struggles. So, if you’re interested in trying a similar approach, here are some keys for making it work. If you let it, the weekend off will stretch as long as you want it to. For me, I’ve set my weekend to Friday night, Saturday, and Sunday morning. It’s a two-day span of time that encompasses two breakfasts, two lunches, and two dinners. But the traditional weekend timeframe might not work with your lifestyle. Maybe you do long shift work and have your time off during the week. Or perhaps you’re better at eating well when you aren’t working, so you’d rather your off days be when you’re at your busiest. Whatever the case, set your timeframe and stick to it so it doesn’t bleed into three days, four, five, six, and you see where this is going. For me, the weekends off are easy. I eat at my favorite restaurants. Try a few new recipes I’ve been eyeing on Pinterest. And in all other ways loosen my belt for a couple days. It’s returning to the cleaner eating that’s more difficult. I’ve discovered -- at least for me -- it has a lot to do with planning and preparation versus will power. For example, eating “off” means more convenience foods like bagels, pizza, cookies, etc. Things you can easily grab. During the week, the foods I eat require more time and attention, so making the switch back can feel labor intensive. For me, using a Sunday afternoon to go grocery shopping, chop veggies, boil eggs, write out a loose meal plan for the week, and regroup mentally is huge. And learning to love those alternative healthy foods makes a difference. You can find healthy foods you love. Here are 20 great make-ahead meals you’ll love. Again, healthy eating isn’t quite as automatic for me. So, I need to be more regimented and planned for it to go down easily. I know all the right things to do, it’s the doing them that’s so hard. If you can, set yourself into a good cooking and eating rhythm. Make meal time predictable. Find your go-to meals for when you’re tired or sick or otherwise wanting to slip back into old habits. One of the biggest things I’ve struggled with since leaving my desk job is having all the times in the day bleed together. And total access to my kitchen 24/7. So, I like to do things like “pack” my lunch and schedule my snacks. Sort of like when I was at work. I have all the food ready and waiting for me, and there’s no need to go digging in the pantry. Just because the weekend is “off” doesn’t mean that I give myself carte blanche. I don’t get absolutely crazy and eat all the foods. I’ll definitely go for that pizza. And the cake. But I try to keep my portion sizes sensible. I try to eat just ONE massively wonderful dessert at a time. And I try to make a lot of these foods from home to help with both portion and wholesome ingredients. 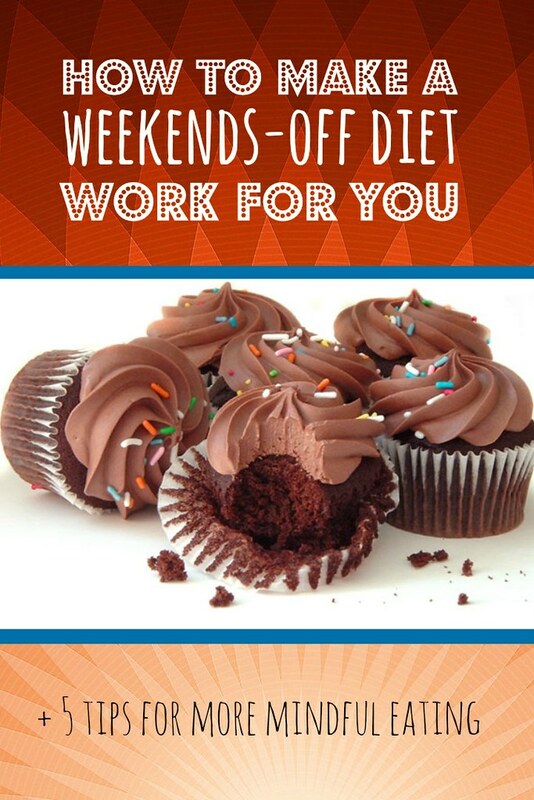 Often I’ve read that a weekends off approach does not work for losing weight. I am too early in my process this time around to truly know (and I’m also mostly using it to help curb my sugar tooth). But keeping loose track of what you eat in the off time will surely help avoid turning a few treats into a full-on gorge festival. There is a difference, though someone will need to remind me of that on Super Bowl Sunday. Mostly, this is all an exercise in mindful eating for me. It’s a way of paying attention to diet and food so it doesn’t have to be some awful exercise in restriction. Instead, it’s taking stock of how food makes you feel. How mindless eating can slip in when we’re bored or tired or whatever else. Eat more slowly -- I know I’m guilty of shoving food down my throat. Really chew your food. Pay attention. Taking your time will give your mind a moment to register if you’re full, etc. Eat in silence -- Obviously eating in silence at the dinner table can be hard. If you’re alone for breakfast, lunch, or a snack, you can try to focus on that meal with your total quiet attention. Eliminate distractions -- And this means switching off the TV, putting away your phone, and otherwise eliminating distractions. Pay attention to flavor -- Take in all the flavors and textures of your food. Following the above steps will help you get there. Appreciate each ingredient or component for its own unique qualities. Know your food -- Eat local foods when you can. Head to your farmers market. Visit your CSA farm. Check out a new restaurant in your area. It will give you a new appreciation for your food. Do you follow a weekends-off approach?